But first, we received the group photo of attendees at the recent AAVSO annual meeting held in Flagstaff, AZ at the Lowell Observatory. 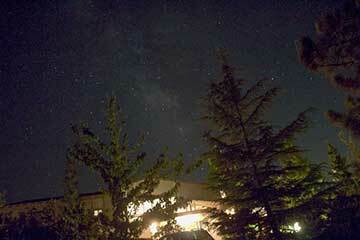 Can you spot the Resident Astronomer in the photo? 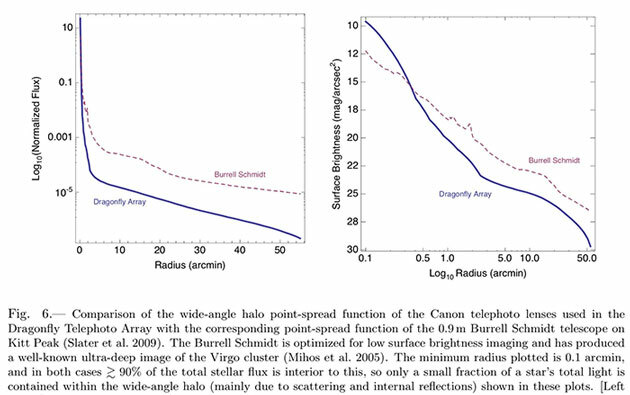 In our previous post of December 5, 2018, we discussed how sometimes how the aperture of giant telescopes can achieve higher resolution of targets by restricting the amount of light captured by the mirror by adding a mask inline with the optical path. This mask with just a few half dozen or so holes makes achieving higher resolution possible through the method of non-redundant masking signal processing. Well, this technique reminded me of another technique used in the Dragonfly Telescope Array to see very dim galaxies better than can be achieved with telescopes having much larger apertures. This concept was first discussed here in the post of August 29, 2016. Looking at very dim, diffuse galaxies and dwarf galaxies has become the current major testing ground for theories about dark matter and galaxy formation. So before reviewing the Dragonfly Array concept, let's look at two surprising finds using that system that are key to the dark matter debate. As an introduction to the two Dragonfly examples of dim galaxies and dark matter searches, we should at least comment on some interesting work just posted by UCI Dr. James Bullock, where simulations of dwarf galaxies and dark matter are getting to the sophistication where they can start putting limits on the nature of dark matter. How neat is that, that cosmological simulations are starting to put limits and constraints on the nature of dark matter that particle physicists can then examine with respect to the required amount of self interaction between supposed dark matter particles. Anyway, the first example is Dragonfly 44, which is a dim galaxy, but still quite massive in that its total mass is estimated to be about a trillion times that of our own sun. Yet, it is very dim. 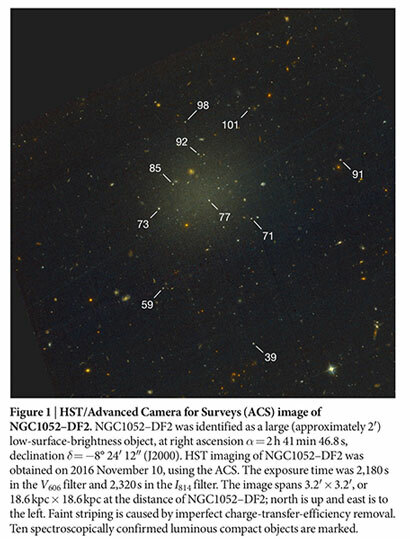 It was found first with the Dragonfly Array and now after many hours of spectroscopic observation using the large Keck telescope to measure velocity dispersion, the findings seem to indicate that the object is mostly made of dark matter and very little luminous matter. 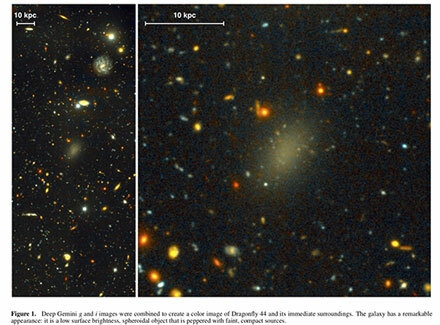 The second Dragonfly example is of DF2, which is a dim, diffuse galaxy, which after doing velocity dispersion studies, contains very little dark matter. So, these two separate findings, one galaxy with dark matter and another one with very little dark matter, if confirmed, will shake up the current understanding of astrophysics of galaxy formation. So in cosmology, dark matter is supposed in order to explain certain aspects of galaxy evolution and rotation curves. But here we have seen an example where dark matter is apparently not part of one galaxy's evolution and history. On the other hand, alternative explanations for the observed effects, such as MOND, which just explains the effect by saying that it is just a consequence of spacetime and no dark matter particle is necessary, but here we see an example of the effect, but no visible normal matter in the galaxy. So, whatever the outcome, these dim diffuse dwarf galaxies are going to be a key part in discovering how galaxies evolve and the nature of dark matter. The reason that Dragonfly Array can outperform much larger telescopes is shown in the following charts. 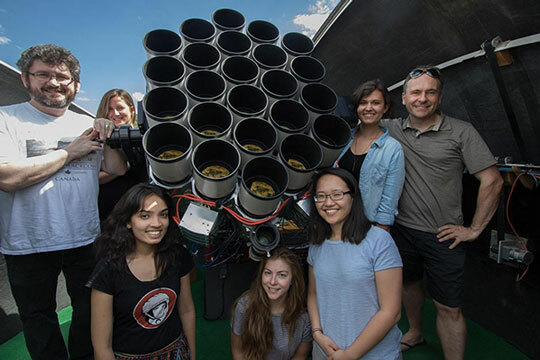 Because the Dragonfly Array design reduces the unwanted, but hard to get rid of, internal reflection and scattering inside large aperture telescopes, it is possible to see dimmer objects. The charts below compare the Dragonfly to a 0.9 meter telescope which had been specifically designed to search for dim objects and its design characteristics reduced internal scattering, but still the Dragonfly outperforms it. Now, just in case you don't recall what a typical iteration of Dragonfly looks like, check out the Dunlap Institute of University of Toronto photo below. You can see where the name "Dragonfly" comes from in that the array is made up of many smaller lenses each attached to its own CCD camera. Every time I see this photo I can't but help to remember the images of the masks used to do non-redundant masking to achieve higher resolution. Here by combining many smaller aperture cameras you are able to capture dimmer objects than the equivalent size single mirror telescopes. Pretty neat! Ok, enough about optics and dark matter, lets take advantage of the cloudless sky and go out an make another attempt at finding the comet 46P/Wirtanen. 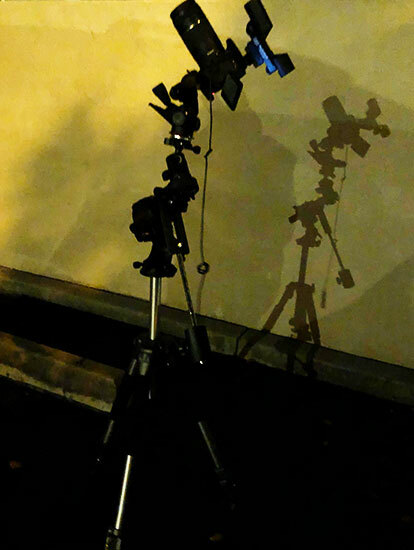 The photo below shows the single-axis Sky Tracker accessory that is made for DSLR tripod operation. It is light enough that I can mostly carry it outside with just one arm. Then I just point the RA axis toward the North, turn it on to track and then adjust the tripod head to point the DSLR to object in question. It makes it pretty easy. As we can see in this non-flash image and shadows, there are a lot of house lights, etc. nearby. So, this 60 second image gets a little deeper image of 46P than the previously posted 8 second image. There are still some star trails which I eventually attributed back to the misalignment in the initial setup in that I was off pointing due north by about 10 degrees. I will have to be more careful next time. My star hopping technique to go from a known bright star to a section of the sky where I could not see anything, especially the comet, took a bit longer this time and I had to pan across the sky and take several long exposure images to finally home in on the comet. I used Aldebaran as the bright star that I could see and then just used the iPhone compass to move to the predicted azimuth location. 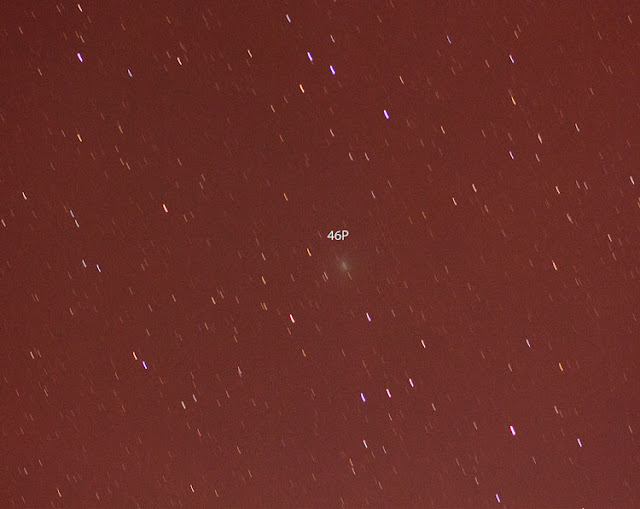 So, this night at least ended with an image of the comet 46P. We are still about week away from the closest and brightest approach on December 16 so be sure to get out your scopes and cameras for that big event, which is supposed to be one where you can do some naked eye observing of the comet.